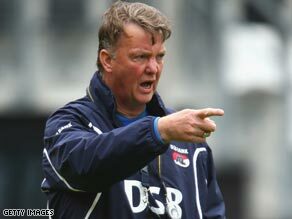 (CNN) -- German champions Bayern Munich have confirmed the appointment of Dutchman Louis van Gaal as their new head coach. Van Gaal will take over from Jurgen Klinsmann at Bayern Munich after leading AZ Alkmaar to the Dutch title. Van Gaal, who led AZ Alkmaar to the Dutch title this season, has been released from his contract with the Eredivisie club and will officially take up the reins as Jurgen Klinsmann's successor on July 1. The 57-year-old has agreed a two-year deal with the Bundesliga outfit. Bayern Munich are currently being managed by caretaker coach Jupp Heynckes, who has steered the club to within goal difference of Bundesliga leaders Wolfsburg, with just two matches remaining this season. "We are happy to have signed an experienced and successful coach such as Louis van Gaal," said Bayern chairman Karl-Heinz Rummenigge in a club statement. Van Gaal has a wealth of European experience, leading Ajax to three consecutive Dutch titles in the mid-1990's, before guiding Barcelona to the Primera Liga title in 1998 and 1999. Following a disappointing spell as Dutch national coach, Van Gaal has restored his reputation at Alkmaar, guiding the club to only the second Dutch title in their history, going on an unbeaten 28-match league run in the process.